By Arfa Mirza in Internet. Updated on January 22, 2019 . Since October 2011, the Internet all over the world is buzzing with the recent issue of Stop Online Piracy Act (SOPA) bill. Millions of Internet users and Internet entrepreneurs are protesting against the newly proposed law. On the other hand there is a strong opposition of politically influential people towards these protestors who favor this law by continuously highlighting its usefulness. The situation of the SOPA bill issue is getting closer to its destination with every passing second. SOPA is a term used for Stop Online Piracy Act (officially known as H.R. 3261) for a bill that was floated in October 2011 at the US House of Representatives. The SOPA bill was presented by Representative Lamar Smith in association with a group of 12 co-sponsors. SOPA traces its roots down to Protect IP Act of proposed in 2008 for preventing real online threats to economic creativity and theft of intellectual property. 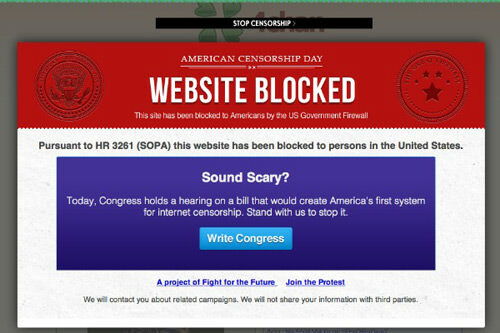 According to the official statement, the objective of SOPA is “to promote prosperity, creativity, entrepreneurship and innovation by combating the theft of U.S. property, and for other purposes.” In simple English, the SOPA bill empowers the US jurisdiction as well as the copyright owners of a particular website to take legal actions against any other website that they find guilty of ‘enabling or facilitating copyright infringement’ in any way. As mentioned earlier, SOPA bill has been proposed to discourage any act of piracy that harms the intellectual property of a US based website or online business. The SOPA bill, if passed, will empower the authority of the US court allowing the Attorney General to seek a court order against the accused website from any part of the world. Removal of such website from all major search engines like Yahoo, Google and Bing etc. Internet service providers will deny their customers from accessing the accused website. The infringing website will not be allowed to do any further business with Internet advertising networks like Google AdSense and BuySellAds etc. In other words the accused site will be sentenced to "online death" for the infringing website depriving it of both traffic and revenue. After reading the aforementioned consequences, one might think that what would be the arguments that favor the SOPA and prompted its proponents to present this bill with such harsh penalties in front of the US administration. Here are a couple of favoring statements from the proponents of SOPA. Other arguments advocating the SOPA and calling the infringing websites at "Rouge Website” stress upon its usefulness by highlighting that this act will empower and secure the motion picture and film industry; the industry that creates 2 million jobs and thousands of micro businesses throughout the US. By reading up till now, SOPA sounds more like a pretty responsible act that is there to defend and secure the genuine intellectual property and sheer hardwork of US Internet users. However, things are seldom what they seem. As soon as the bill was presented, the word got out and spread all over the world wide web like wildfire. Millions of Internet users and online service providers were hit by a bolt. Soon different blogs, discussion forums and social networking websites were inundated with anti-SOPA content protesting and highlighting the possible catastrophic affects of this act on the Internet and its users. EFF resisted SOPA saying that SOPA will not only hinder the process of free speech but has also warned that Etsy, Flickr and Vimeo all seem likely to shut down if the bill becomes law. One of the most intense protests was carried out by Yahoo which has reportedly quit the US Chamber of Commerce over its keen support for SOPA. 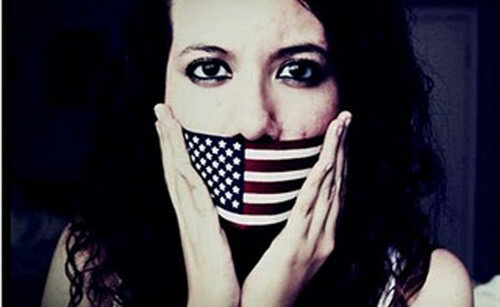 The antagonists of SOPA consider it as an infringement to the First Amendment and call it an "The Great Firewall of America" posing a serious threat to free speech. According to the mechanism of SOPA, it has the authority to blacklist any such website that will be involved in online piracy and infringement. Opponents of SOPA are of the view that the penalties of the bill are so disconnected to the actual criminal act that it will destroy web hosting and e-commerce industry and cause the Internet’s potential progress to halt in terms of investment as well as research and development. The basic issue with SOPA bill is that it is unable to distinguish between a commercial and non-commercial use of copyrighted content. Whoever will upload a copyrighted content on websites like YouTube for the mere purpose for sharing will be held liable and will have to face the consequences. Moreover, as well all know that the series of democratic revolutions that occurred in the Arab countries, known as the Arab Spring, partially owe their success to worldwide Internet content. However, according to the SOPA law, the proxy servers used during the Arab Spring fall into the category of copyright infringement making it a criminal act and eventually hindering the process of whistle blowing and free speech. I would like to conclude this piece of writing by quoting a saying that “one man’s fortune is the other’s misfortune”. However, in the case of SOPA, the bill will be a cause of misfortune for millions of Internet users and online business owners throughout the globe.